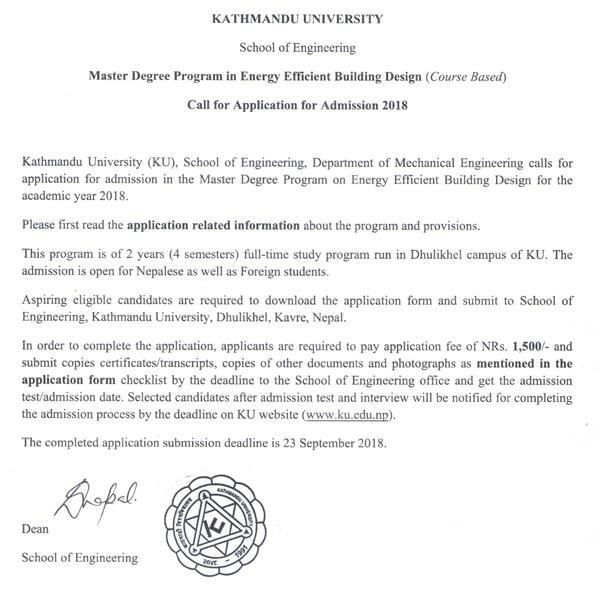 Kathmandu University (KU), School of Engineering, Department of Mechanical Engineering calls for application for admission in the Master Degree Program on Energy Efficient Building Design for the academic year 2018. Please first read the application related information about the program and provisions. This program is of 2 years (4 semesters) full-time study program run in Dhulikhel campus of KU. The admission is open for Nepalese as well as Foreign students. Aspiring eligible candidates are required to download the application form and submit to School of Engineering, Kathmandu University, Dhulikhel, Kavre, Nepal. In order to complete the application, applicants are required to pay application fee of NRs. 1,500/- and submit copies certificates/transcripts, copies of other documents and photographs as mentioned in the application form checklist by the deadline to the School of Engineering office and get the admission test/admission date. Selected candidates after admission test and interview will be notified for completing the admission process by the deadline on KU website (www.ku.edu.np). The completed application submission deadline is 23 September 2018.